RichTextBoxEx – an extended version of the Windows Forms RichTextBox control which automatically loads the newest available version of the native RichEdit control (required for advanced functionality). TextExtensions – provides extension methods for working with ranges using a more familiar syntax, as well as conversion of math text to OMML and MathML. Fixed RichTextBoxEx being unable to select the correct RichEdit control where multiple versions of Office have been installed. Fixed the SuspendRedo and ResumeRedo methods in TextDocument not working as documented. Added the ability to manually specify a DLL and window class name for RichTextBoxEx to use. Other minor tweaks and enhancements. Extract the binaries to a location on disk. Note: You may have to right-click the DLLs and select the ‘Unblock’ option on the Properties window (in order to fix trust issues in Visual Studio). Add a reference to the required assembly (x86 or x64, TOM 2 or TOM 1-only) to your project. Note: You may have to manually add RichTextBoxEx to the Visual Studio toolbox if it does not automatically appear. 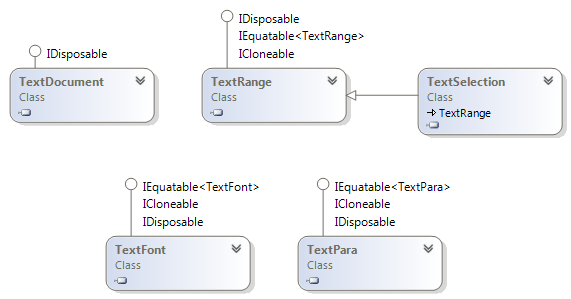 Explore the TextObjectModel namespace and refer to the documentation to start using the TOM classes. Hi Brad. This looks like a tremendous opportunity. Interfacing via TOM looks like a massive improvement for the RichTextBox. Thanks for the insight. And building your own wrapper libraries, wow. Just one question: are you aware of compatability issues with Windows 7 ? I am getting a FileNoteFound error. This article (http://blogs.msdn.com/b/murrays/archive/2012/03/03/richedit-8-0-preview.aspx) implies significant availability for TOM for Windows 8, but his previous posts (eg: http://blogs.msdn.com/b/murrays/archive/2009/09/05/richedit-versions-update-to-7-0.aspx) mention material version differences between what comes with the OS and MS Office. My target is to cater for Win7 + Office 2010 and above. I’m wondering if I have to make it Windows 8. Any insights woud be appreciated. Thanks in advance. You must have the 32-bit version of the Visual C++ 2010 Redistributable installed. If this is absent, your application will compile but you will get an exception at run-time. Your application must target either Any CPU or x86. On x64 you will get a BadImageFormatException, because the native code in TextObjectModel.dll is 32-bit. Very Strange. My dev machine is Win7 x64, running VS2010. I’m using your C# demo project, but had to remove the C++ project from the solution because its not backward compatible (not that I’d know how to read/troubleshoot it anyway). Instead I added an assembly reference to TextObjectModel.dll. Is still set to build x86. Seems simple enough. Hit [F5] and the OnShown method throws FileNotFoundException: “Could not load file or assembly ‘TextObjectModel.dll’ or one of its dependencies. The specified module could not be found.”. I downloaded the VC++ redistributable just in case but the install tells me that it cannot install because a newer version already exists. Framework 4 is obviously installed already. Any suggestions on how to check for other “dependencies” ? Got it. MS Dependancy Walker reports the dll needs MSVCR110.DLL. This can be found in the VC++ *2012* redistributable (http://www.microsoft.com/en-us/download/details.aspx?id=30679#). Installed it and bingo. It would be great the you include also the interfaces to each class. In the file TextRange.h, is following code an implementation of IDisposable.DIspose() method? In C++/CLI, the destructor syntax (~) is used to implement IDisposable.Dispose to release managed resources, whereas the finalizer syntax (!) is used to release unmanaged resources. In this case, I am releasing unmanaged resources (the COM object that represents the range). I asked the question because I was not sure whether or not to call Dispose() on TextRange object. If you want to release the resources immediately after you have finished using them, you can call the Dispose method (or wrap with a using statement), but it will not cause a memory leak if you choose not to; the resources will be released by the garbage collector at a later point in time. I am developing under WinXP using VS2010. with .NET 4.0. Your Tom2 seems to work fine (I have office 2007 installed). BUT…. So I had to copy the file msptls.dll from “C:\Program Files\Microsoft Visual Studio 10.0\Common7\Packages\vwd\msptls.dll” to my application directory where the ManagedTom2.dll is. No problems after that. I suspect this is a component of the vs 2012 runtime which is required to build/use the assembly. I did not actually expect it to work on Windows XP, but it’s good to know that this is possible. Thanks! Coding under: WinXP .NET 4.0 Visual Basic, Office 2007 installed. With the TOM2 dll, when I inherit from TextObjectModel.RichTextBoxEx, attempting to change WordWrap throws an out of memory exception. A reminder that this project’s minimum requirements are Windows Vista and .NET 4.5 – although it may work under XP and .NET 4, this environment is untested and unsupported. Rather unsurprisingly, I couldn’t reproduce your problem under the recommended environment – text wrapping was changed successfully whether loading a file using the RichTextBoxEx.LoadFile method or the TextDocument.Open method – verified this on x86 (Win8 RichEdit control) and x64 (Office2013 RichEdit control). It may be worthwhile checking which version of the native RichEdit control is being loaded by RichTextBoxEx – using the debugger, place a breakpoint on the line of code which throws the exception and inspect the variable – you will be able to see the native control name under CreateParams (and also under _windowClassName in Non-Public Members). If it shows RICHEDIT60W, it will be using the Office version. If RICHEDIT50W or RICHEDIT20W, it will be using the Windows version. One of these may not support the WordWrap property. No doubt it’s XP that’s the problem. I went back to Tom1. Eventually I’ll get a better machine and use the full capabilities of Tom2. Anyway, thanks for the wrapper. It really extends the usefulness of the RichTextBox! I cannot get lists to display properly. The bullets nor any other numbering scheme don’t show up. All that happens is that the paragraph(s) get slightly indented, as if there is a list. But no numbers or bullets or letters! I have set the listnumberingformat and liststart several different ways. I now run Windows 10, .NET 4.5, Visual Basic 2015. Office 2007 installed. I create the textdocument from the standard windows forms richtextbox. Have also tried it from your richtextboxex, with the same result. I haven’t tested the code on Windows 10, which may have a different version of the TOM classes than Windows 8/8.1. This could also be an architecture mismatch, i.e. 64-bit process with 32-bit Office, or vice versa. Also try the TOM1-only version of the DLL, as you may get different results. Another problem. This time with hyperlinks. Here’s an example. Now DOC.EntireRange.Select() looks like this!!!! The hyperlink has disappeared! What happened to the hyperlink between saving and loading???? This is an implementation detail of the native RichEdit control; if the DetectUrls property of the control is set to true (which is the default), then it will discard any hyperlinks without a recognised URL scheme upon loading. You must set this property before you obtain the TextDocument object from the control. I noticed that setting a text selection to AllCaps seems to block the ability to then do a ToggleCase. Same thing happens using SmallCaps followed by ToggleCase. Is this a bug? Just curious. There is a workaround. My understanding is that AllCaps and SmallCaps are actually font styles and thus they don’t change the underlying casing of the characters, so you would have to remove those styles from the selection before your changes would be visible. So not a bug, just an implementation detail by Microsoft in this case. The current version of the DLL was built against the Visual C++ Redistributable for Visual Studio 2012 Update 4 – try installing this. I will update the page accordingly. Alternatively, you could try grabbing the source code and re-targeting the solution to use the latest Windows SDK version.